This image tells you everything you need to know. Metroidvanias are easily my favorite platformer, and always will be. A Metroidvania is a style of platformer (usually 2D side-scrolling) where you play a character that explores a vast area and grows in power by leveling up from killing enemies and finding power-ups/money to purchase power-ups along the way. In some games (SOTN), those purchasable items are not the end-game content, some games they’re a little more important. 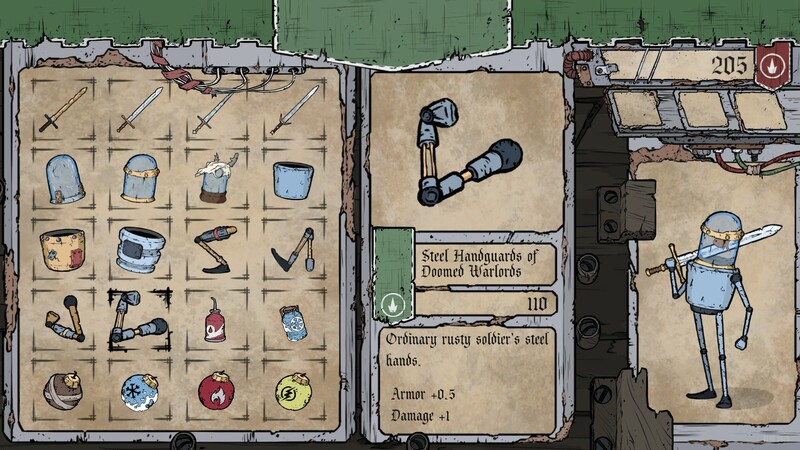 But I love these games so very much, and when I was pitched the description of Feudal Alloy, I was onboard immediately. 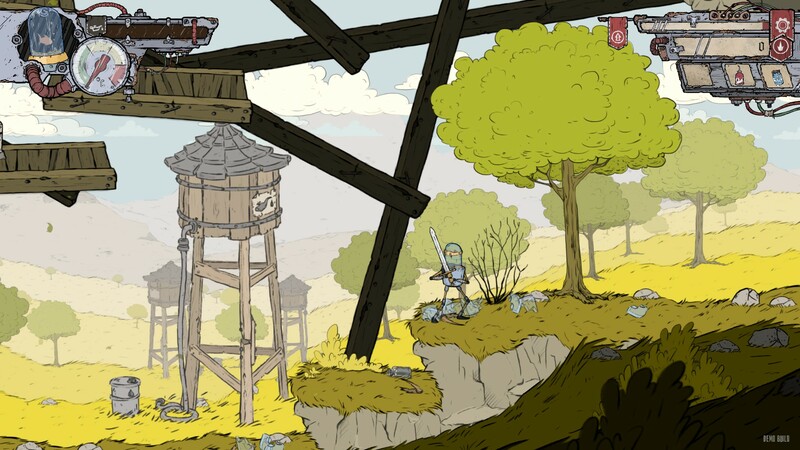 Feudal Alloy is a 2D Metroidvania that looks hand-painted. But what’s best of all, you play a robot piloted by a fish! 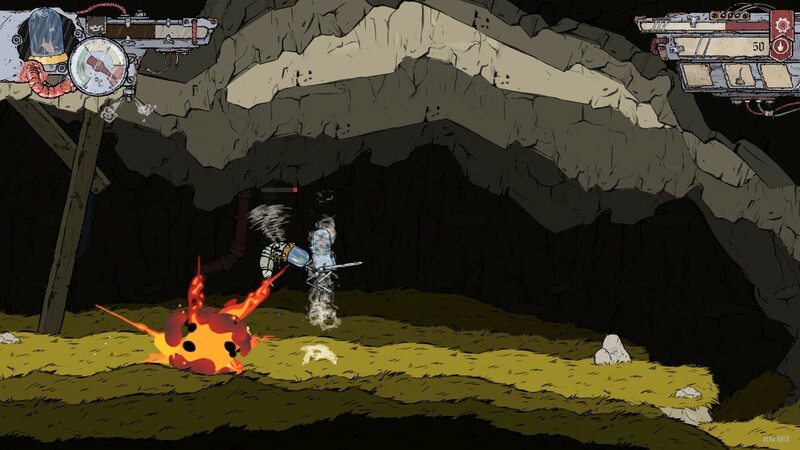 Yes, a goldfish-powered robot, that swings a sword to explore this vast, beautiful world. I cannot stress enough how much fun this was for me. Not pictured: Several creepy robots, now deceased. If that doesn’t sell you, I don’t know what possibly will. This Alpha was fairly short, up to about the first boss, but there’s a lot to learn in that hour or so timeframe. Less, if you’ve already completed a playthrough and know the secrets/skills. 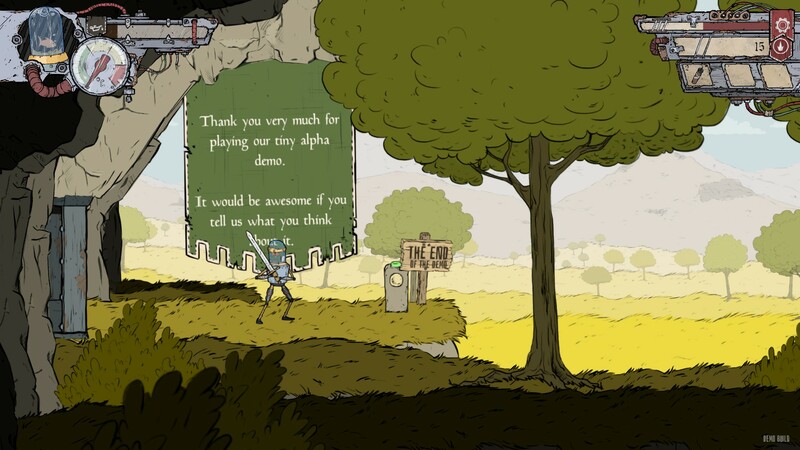 Feudal Alloy is different from practically every other Metroidvania I’ve ever played, and that’s certainly a good thing. 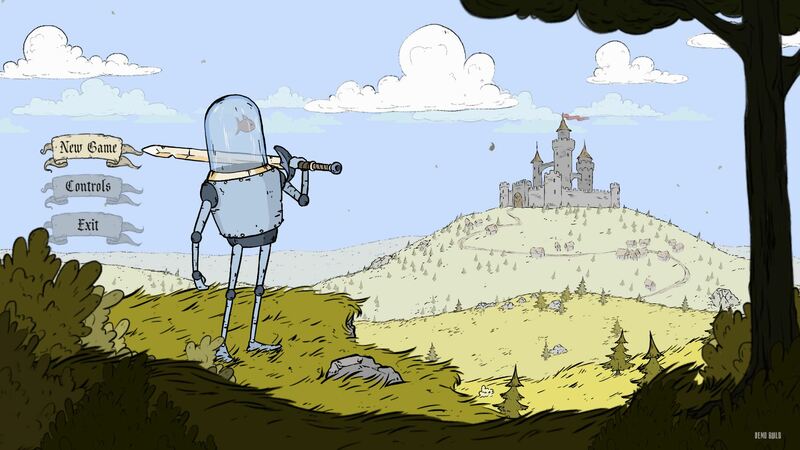 I always say you shouldn’t necessarily reinvent the wheel, but the changes/strategy employed in Feudal Alloy made sense and were challenging without being frustrating. For the most part, anyway. Your health bar is associated with oil (you’re a robot), and your attacks fill up a heat gauge, which lowers over time though you can use some coolant to expedite that. Coolant is pretty plentiful, but in this phase of testing, oil definitely is not. I only found a few health drops, which I wound up needing to use sooner rather than later. But you can go back to the start and purchase oil, as well as bombs and armor upgrades. You can very easily overheat -be careful. With this in mind, you have to really pay attention to what you’re swinging at, because enemies hit hard, and you don’t want to just stand in range of being hit, swinging away. If you overheat (and you will), you can’t attack until the meter empties. As you kill enemies, you’ll level up (and thankfully it grants a full health restore) and can unlock new skills in one of three trees. For now, only one tree is open, all the way to the fourth skill (which is an awesome explosion move). I cannot stress enough how powerful that explosion is, and how useful it is for grinding. It uses most of your heat gauge, and you access it by crouching and hitting block. These aren’t screens filled with enemies, at least not yet, but with careful movement and planning, you can use it to even hit enemies in the air, because this move is accessible on ladders. Money was pretty hard to come by. This has all the staples of a Metroidvania: Infuriating enemy patterns, lots of damage, mazes, backtracking, buying/finding items, and secret areas! It’s pretty easy to see the hidden areas for if you’re paying attention anyway. There are spots on the ceilings and walls that are boarded up, which you can break with a few sword swings. I don’t think they’re “too easy” to see, but they fit in nicely with the overall aesthetic. However, there is something I think this game needs more of and that’s Saving. I redid about 10-15 minutes of this demo a good ten times because I either wasn’t strong enough/accidentally took almost a full health bar of damage before the boss/couldn’t figure out how to get around the spike traps. Because spike traps, like in the old days, meant instant death. There’s a section before the boss where spike traps pop up in a certain rhythm or pattern. I still am not 100% sure how I got through it but died there oh so many times trying to. It wasn’t long, but it was definitely enjoyable. Despite a lack of save spots (there are some, but this zone could probably use one more), I loved playing this. I’m going to keep a close eye on its development as well. A lot of the things that I’ve enjoyed about the genre are here. I’ve never cared about having to backtrack or loop around an area simply to progress because that’s a great way to level, farm, and find secrets. Plus, you aren’t playing as a Vampire Hunter, or a Bounty Hunter. You’re a fish. A fish that’s piloting a suit of mechanical armor. You can upgrade it, gain powers, hurl grenades, and explore an absolutely gorgeous world. It’s already shown itself to be challenging, and from what I read on Steam, other areas will use other color palettes/themes and should be exciting. I love this art style, so I’m excited to see what’s done with it. Sometimes it’s hard to see what items that drop are exp, and what’s just scrap though. When you kill an enemy, they explode into parts that you can walk over to acquire unless they’re usable items, then you have to hit down to get them. That’s fine, but sometimes I was could miss exp items because they blend in, or explode and bounce away. It’s got a ways to go yet, but Feudal Alloy has definitely captured my attention with smooth gameplay, delightful visuals, and a great gimmick. A code was provided for this review. I want to give it a shot.